For Flash Search Engine Optimization fans, this will be very interesting! The first part of my research project into how Google and Yahoo use Ichabod to index flash is complete. OK. Before you get all excited about what you see above, let me give you the caveat that results may vary slightly on your browser, however they should generally be the same. The Google search for duanes world was done on a machine in Vancouver, Canada (Google provides some regional variances for search results). 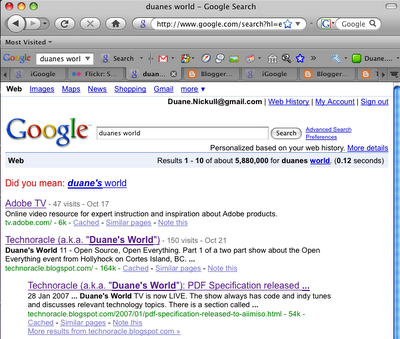 For the search "Duanes world", the site http://tv.adobe.com beat out http://technoracle.blogspot.com. The latter has a huge text "Duane's World" across the top while the former is built completely in flash. Even more spectacular is the fact that the Duane's World episodes are in fact dynamically loaded at runtime by the flash page template. There are factors that influence this so it is not a pure experiment. External links to these pages and user click patterns obviously are factors in this elevation. What is important is to see the patterns of Google and Yahoo actually picking up text from Flash. UPDATE: Ignore the following section on Pixton. I made a really dumb mistake and Google was in fact indexing the alt text to a jpg rather than actually reading SWF content. Read the synopsis words very carefully, then go to the link and you will note that Google has in fact read static text from the flash comic strip at Pixton.com. For Flash Search Engine Optimization, there are other studies I am doing which will be released live at the MAX 2008 show in Milan Italy. I just finished speaking at the Web 2.0 Expo in Berlin on the topic "Search Engines and Flash: Secrets, Tricks, and Black Magic"
Adobe Flash (*.swf) is a binary format and has not always been accessible to search engine spiders (small bits of code that algorithmically determine a page’s content for rankings in search engines). SEO experts have developed several key workarounds and new technical developments have made new functionality available to search engines and developers alike. During this talk, I showcased some advanced tips, tricks (Black Magic) and some of the secrets I have used to get sites ranked over their HTML counterparts. Attendees will learn how to increase initial page rankings as well as monitor and increase dynamic page ranks. Sites like Sombrio come up #1 out of over four million and are 95% flash. So how does it work? The slides have some tips but the real work will be revealed when the research project findings are announced at MAX in Milan this Dec 2008. The slide deck discusses a number of great strategies including using XHTML as an XML data provider for data grids (this way allows use of the semantics of the title and h1 tags while offering your Flash content in plain text for bots to digest). Remember - Adobe MAX 2008, Dec 3 is when the results will be shared. At that event, we will distribute all the finding for anyone to analyze! Be there! Oh - one more thing. Do not do evil things to get to the top of Google. There is a system and a set of rules. You do not have to abuse the rules to win. Trying to get high rankings for terms your site is not relevant for serves no one, yourself included. Adobe is particularly notable from an enterprise pace layering perspective because unlike many other technologies that fall under the heading Service Oriented Architecture (SOA), Adobe has focused on delivering service oriented front ends that can be integrated with back end services with a minimum of fuss and code. This is loose coupling - of distributed components. James observes that we at Adobe have had trouble communicating well in the past. We are an enterprise software vendor and we have a very mature SOA story. LiveCycle ES is a textbook example of SOA in action when deployed with SAP systems. During SAP CEO Leo Apotheker’s keynote on Tuesday morning at TechEd 2008 he introduced a new concept called Timeless Software. In fact, this expression itself is timeless as noted by Christopher Alexander in "The Timeless Way of Building". Regardless of the changes in technologies and user interface designs, the separation of concerns (a pattern often noted as MVC) has been taken a step further. This is a pattern worth noting for the upcoming Web 2.0 Design Patterns book. Kudos to Leo for explaining this and kudos to James for translating it so mere mortals can understand the immense value of this timeless way of building. Apple losing the Web 2.0 crowd? Last year at the Berlin Web 2.0 conference, I took this photograph of the entire front row sporting Mac laptops. The blog post was entitled "Does Apple own Web 2.0?". This year the trend has seemed to be more of a Microsoft/Mac stalemate. It appears that Vista has really come into favor with some of the alpha geek crowd. I also see Ubuntu gaining in popularity. Apple's iPhone, while popular, continues to suffer from complaints of bad battery life. The most popular PDA by far is the Blackberry. Long battery life, great business features and a sleek and cool design. While I was contemplating buying some apple stock, I am now thinking RIM looks like a great deal. Here is the video. Special thanks to Lee Brimelow and Kevin Hoyt for the help and code samples on this topic. Yes - I did really scoop the last cold beer at the meeting! If you want the slides, please email me at dnickull at adobe dot com.